There is a growing consensus among Pakistani state leaders that the nation’s main security threats may come not from India but from its spiraling internal conflicts. 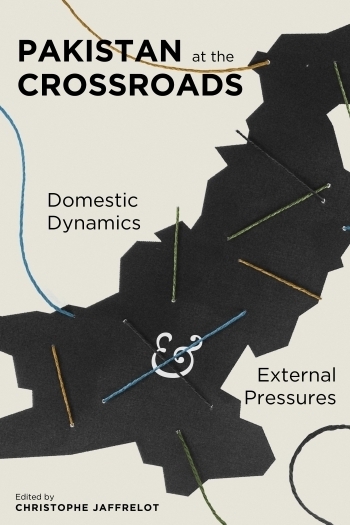 In Pakistan at the Crossroads, edited by Christophe Jaffrelot, top international scholars assess Pakistan's politics and economics and the challenges faced by its civil and military leaders domestically and diplomatically. Contributors examine the state's handling of internal threats, tensions between civilians and the military, strategies of political parties, police and law enforcement reform, trends in judicial activism, the rise of border conflicts, economic challenges, financial entanglements with foreign powers, and diplomatic relations with India, China, Iran, Saudi Arabia, Afghanistan, and the United States. Pakistan has been characterised by scholars, among other things, as an "ideological state" (like Israel) because of the political reinterpration of Islam by its founding fathers - including Jinnah; (b) a "garrison-state" because of the key role of the military; and (c) as a "quasi-failed state" because of the rise of radical Islamic movements in its midst. But its trajectory may be best captured by another, encompassing feature not contradictory with the qualifications mentioned above: its ability to navigate at the interface of domestic and external dynamics - which makes relevant two others formulas - that of "client-state" and "pivotal-state". Every country strategises at the crossroads of the national and the international - to say nothing of the transnational - to maximise its resources. But in the case of Pakistan, this interaction has reached uncommon proportions, given its geographic size, its population (almost 200 million people), and its nuclear status. Countries of the same league are generally less dependent upon outside support and less porous to foreign influences - be they religious, cultural or economic. The root cause of this extraversion lays in the Pakistani feeling of vulnerability that crystallised vis-à-vis India as early as 1947 - a sentiment that was reinforced by the then hostile attitude of Afghanistan. Subjected to encirclement, Pakistan looked immediately for external support. The US was the first country Pakistan turned to, but it also made overtures to China and Middle Eastern countries, especially when Washington distantiated itself from Islamabad. While this policy was primarily associated with the army, whose quest for foreign, sophisticated military equipment knew almost no limit, civilian politicians rallied around the same strategy, and not only for security reasons. Among other things, the political personnel - which drew mostly from a tiny elite group - found financial support from outside a convenient way to obviate a modern taxation policy, one which their milieu and key supporters would have resented. The political economy rationale of the army’s extraversion cannot be ignored either, since the Pakistani military does not pay taxes either and has developed business activities. The Pakistani army, therefore, enjoys a much better lifestyle than the rest of society. Civilians and military officers also converged in the use of (sometimes foreign) Mujahideens in the waging of jihad in Afghanistan and Kashmir - the favourite tactic of the army over the last three decades. Z.A. Bhutto supported Hekmatyar and Rabbani against the Kabul regime as early as the 1970s. This strategy gained momentum under Zia during the war against the Soviets. But Benazir Bhutto was Prime Minister of Pakistan when the army supported the Taliban and when Islamabad recognised their regime in 1996. And neither Benazir nor Nawaz Sharif had objections towards the support of foreign Mujahideens in Kashmir. The promotion of external ties by the military and the civilians for security and socio-economic reasons reflects the growing commonality of their worldview and (more or less licit) interests. Their elite groups do form a closely knit establishment comprising of a few hundreds of families. Indeed, the difference between the most authoritarian phases of civilian rules and the most moderate forms of military dictatorship, tended to differ in degrees more than in nature over the last twenty years. As a result, Pakistanis may look for alternatives to their rulers not among the usual suspects any more (the dominant opposition party or a new Chief of Army Staff), but out of this circle entirely. They may turn more to the judiciary, parties which have not been tried yet and ... the Islamist forces which do not articulate a discourse of social justice inadvertently. Are these developments the indications of even more domestic tensions in a country already on the verge of civil war in regions like Balochistan and Karachi? And what part can the external variable play in this context? These are some of the questions this volume tries to explore. Pakistan: a client state or a pivotal state? 1. The Congress has accepted the present Settlements with mental reservations. 2. They now proclaim their determination to restore the unity of India as soon as possible. 3. With that determination they will naturally be regarded as avowed Enemies of Pakistan State working for its overthrow2. The need to defend Pakistan was particularly acute among the security apparatus. Ayub Khan, who was to be appointed chief of the army in 1951, considered in 1948 that “India’s attitude continued to be one of unmitigated hostility. Her aim was to cripple us at birth”3. As a result, as Khalid Bin Sayed wrote in 1964, so far as foreign policy is concerned, “Almost every action of Pakistan can be interpreted as being motivated by fear of India”4. Indeed, as late as in 1963, an editorial of the newspaper founded by Jinnah, Dawn emphasized that, “If the main concern of the Christian West is the containment of Chinese Communism, the main concern of Muslim Pakistan is the containment of militarist and militant Hinduism”5. The fear of India was reinforced by the Afghan attitude. In the 1940s, Kabul had asked the British to let “their” Pasthun tribes to decide whether they wanted to accede to Afghanistan or to become independent. Pakistan was not even an option. After the creation of Pakistan, Afghanistan refused to recognise the Durand Line as an international border. As a result, Pakistan was doubly unachieved, with Kashmir partly under the control of India and its western frontier still unofficial. To make things worse, some Afghan leaders supported the irredentist idea of Pashtunistan, which would have amalgamated the western districts of Pakistan to those of South Afghanistan to form a new, ill-defined, administrative unit. In September 1947, Afghanistan was the only country in the UN not to support the entry of Pakistan. At the same time, like the Pashtun nationalist leader Abdul Ghaffar Khan who had supported the Congress against the British, the Kabul government was close to India. Pakistani leaders turned first to the US for support. Jinnah tried primarily to “sell” his country’s strategic location. In September 1947 he declared: “The safety of the North West Frontier is of world concern and not merely an internal matter for Pakistan alone”6. The US concurred when the Cold War unleashed itself in Korea. The US recognised Pakistan as one of their regional brokers in charge of containing communism in Asia. This security-based rapprochement was made easier by the rise to power of two (ex-)armymen, Eisenhower and Ayub Khan. Pakistan joined the Southeast Asia Treaty Organisation (SEATO), the Central Treaty Organisation (CENTO) and, in exchange, got access to increasingly sophisticated American arms and substantial financial aid. After ups and downs, this relationship culminated during the anti-Soviet war in Afghanistan when the Pakistani army was offered billions of dollars, plus F-16 fighter jets, to support the Mujahideens. The post 9/11 war in Afghanistan resulted in even more arms and money. In thirteen years, from 2002 to 2015, Pakistan, a partner of the US in the war against Al Qaeda and Islamic terrorism at large, has received about 26 billion dollars, as well as arms (including F-16s, more useful against India than against the Taliban). Since more than half of this amount was security-related, the US government financed about one fifth of the regular military budget of Pakistan. These developments may suggest that Pakistan is, in fact, a kind of rentier state. But the countries which are usually described that way owe this quality to their natural resources (typically, oil and/or gas). In the case of Pakistan, the rent comes from the strategic location of the country - it is a frontline state facing global threats like communism or Islamic terrorism. The difference does not end here. Rentier states are usually more passive than Pakistan. In contrast to the oil producing countries which did mostly one thing only - they built the OPEC -, Pakistan advocated its case vis-à-vis the US to become a client state. It obliged its patron by acting according to its wishes in order to deserve the billions of dollars it got. Certainly Pakistan retained some autonomy, but it also took risks - as evident from the Soviet reactions when Moscow discovered that the U2s which were flying over its territory came from Pakistan. A clientelistic relationship is often unstable. Based on mutual interests more than on affinities, cultural or ideological, it is subject to constant renegotiations. Today, Pakistan is keen to renegotiate the terms of its relations to the US for several reasons, as I show in this volume: Islamabad and Washington do not share a common enemy any more in Afghanistan, the US-India rapprochement has transformed the old regional equation, and the Obama administration is seen as damaging the country’s sovereignty. In fact, Pakistan would very much like to pivot to other patrons - including China and Saudi Arabia, as it did partly in the past. In 1950, Pakistan recognised China when this country was rather isolated, as if Karachi (the then capital) was preparing the future, understanding before everyone else that Peking was bound to have complicated relations with India - in spite of the then warm relations between Nehru and Chou-En Lai. China, appreciative of the Pakistani’s move, decided to exchange its coal against their cotton, which had no place to go after the Indian mills were cut off from the places where this textile plant was produced. Diplomatically, the Pakistano-Chinese rapprochement found expression in the way Karachi spared Peking at the UN during the Korean War. In 1963 Pakistan and China granted each other the status of the most favored nation and the airlines of both nations were allowed to operate in the other’s territory and sky - something Chinese leaders appreciated since they could now go West through Pakistan. But the real turning point came about when China attacked India in 1962. Not only did this war reconfirm that Peking and Islamabad had a common enemy, but afterwards both countries, in December 1962, swapped some territory in Kashmir - something India resented a lot. The following war, between India and Pakistan in 1965, gave an opportunity for China to show its benevolence to her partner in South Asia. She displayed signs of solidarity, while the US were imposing sanctions against Pakistan as well as India - which, being bigger and closer to the USSR, was bound to be less affected. In 1967 both countries signed a maritime agreement to provide port facilities to each other’s ships. Diplomatically, China supported Pakistan as one of the permanent members of the UN Security Council on the Kashmir issue and Pakistan helped China to relate to the US after Nixon decided to make overtures to Peking. When Kissinger secretly traveled to China to prepare the ground for Nixon’s visit, he left from Pakistan, accompanied by high ranking Pakistani officers. In the domain of defence, China helped Pakistan to balance its dependence vis-à-vis the US by selling arms. As early as 1967, China committed itself to deliver one hundred tanks and 80 MIGs to Pakistan. In 1982, Chinese weapons systems made up 75% of Pakistans tanks and 65% of its air force. In 2005 China provided Pakistan with four naval frigates, and today, China and Pakistan are jointly producing the J-17 Thunder fighter. In the same vein, China helped Pakistan to develop its nuclear bomb. In 1986, China and Pakistan concluded a comprehensive nuclear cooperation agreement. But, in fact, both countries were already cooperating clandestinely in this field. By the mid-1980s, Pakistan had acquired sensitive technologies to build it bomb from China. During the folowing decade, Beijing helped Islamabad to build a 40 MW reactor which could be used to provide plutonium for its weapons program7. For China, arming Pakistan was clearly a good way to force India to look West instead of looking East since the two largest Asian powers are potentially rivals in the ASEAN zone. Besides, Pakistan has given China an access to the Indian Ocean. First, in 1967 the ancient Silk Route between the Xinjiang and Gilgit was “reopened”. Then, in 1971 the Karakorum Highway was inaugurated. Culminating at 4,693 meters above sea level, it is still the highest paved international road in the world. Ultimately, this route is supposed to lead to Gwadar, a baloch deep-sea port in which the Chinese have invested 200 million dollars and 450 personnel for its construction since 2006. But constructing the planned 3,000 km long railway line between Kashgar and Gwadar will cost up to 30 million dollars per kilometer in the highest mountains, and to make things even more complicated, the highway will go through one of the most unstable provinces of Pakistan, Baluchistan. Guerillas have already kidnapped and killed several Chinese engineers in Gwadar. Whether Pakistan will be in a position to pivot to China in order to emancipate itself from the American influence is not easy to predict, as Serge Granger and Farah Jan emphasize in this volume. China may be cautious not to alienate India, an emerging power and an important trade partner. Additionally, the Chinese worry about the connection between Uyghurs and Pakistani jihadis. Uyghur activists have been trained in the Pashtun area and Beijing may consider that – at least till the 2014 North Waziristan operation - the Pakistani army has been too complacent with the Islamists in general, not in favour of the Uyghurs, of course, but at the expense of the stability of the country and the fight against terrorism. Finally- and most importantly - China is not prepared to help Pakistan financially as much as the US is. When Islamabad turned to Beijing in 2008, while it was coping with a severe economic crisis, Beijing had only small loans to offer. The other partner to which Pakistan could turn is Saudi Arabia. In fact, the Middle East was the region of the world where Pakistan found its first allies, preceeding even its alliance with the US. In the early 1950s it signed treaties of friendship with Iran (1950), Iraq (1950), Syria (1950), Turkey (1951), Egypt (1951), Yemen (1952), and Lebanon (1952). But, considering the American support to Israel, many Arab countries objected to Pakistan joining CENTO in 1954. The Saudi Ambassador to Karachi described this move as “a stab in the heart of the Arab and Muslim states”. Many Arab countries also strongly objected to the Pakistani support of the West during the Suez crisis (1956) - including Saudi Arabia and Egypt which felt closer to India at that time. By the 1960s, Pakistan, in the Middle East, was left with few non Arab, pro-West allies, most importantly Iran and Turkey, with whom Pakistan created the Regional Co-operation Development in 1964. In 1962, Saudi Arabia did not support Pakistan when a resolution on Kashmir came for discussion in the UN, so as to not alienate India. Things changed after the 1971 war. Pakistan probably considered itself as being more part of the Middle East after its – bordering South East Asia - Bengali wing was gone. More importantly, the country felt very vulnerable - and let down by the US which, again, had not done much to support Pakistan against India except to send the aircraft carrier U.S.S. Enterprise to the Bay of Bengal. In spite of what official history textbooks say, China did not come to the rescue of Pakistan either. Z.A. Bhutto, who had always had reservations vis-à-vis Pakistan’s American allies, made a “Journey of resistance” to Iran, Turkey, Morocco, Tunisia, Lybia, Algeria, Egypt and Syria. His tour continued in May-June later that year, as he visited Saudi Arabia, Kuwait, UAE, Iraq, Lebanon, Jordan, Ethiopia, Mauritania, Guinea, Nigeria, Sudan and Somalia. He was mainly looking for money for the Pakistani economy and to build the “Islamic bomb”. According to Zahid Hussain, Libya “supplied Pakistan with uranium from 1978 to 1980”8. In 1998, it seems that Saudi officials attended the Pakistani nuclear test and the Saudi Defense Minister visited the laboratory of the father of the Pakistani bomb, A.Q. Khan in 1999. What did Pakistan have to give in return? Soldiers have been one of its most significant export products. Between 1972 and 1977, Islamabad concluded military protocols with Saudi Arabia, Libya, Jordan (where General Zia ul Haq served against the PLO), Iraq, Oman, the UAE and Kuwait. By the late 1970s, Pakistan had sent almost 2,000 military advisors and trainers to the Middle East. That was the beginning of a long-lasting relationship. Approximately 50,000 Pakistani soldiers served in the Middle East in the 1980s, including 20,000 in Saudi Arabia, a country which was becomming a close partner of Pakistan. In 1981 Riyad financed the $ 800 million purchase of 40 F-16s. and in the 1980s, Saudi Arabia also paid for the Pakistani bomb in a context that was now dominated by the post-Iranian revolution situation and the anti-Soviet Jihad in Afghanistan. The Iranian Revolution resulted in a competition between Pakistan and Iran - between Sunnis and Shias - and the Afghan war fostered the Saudi mobilisation in favour of the anti-Soviet Mujahideen. Riyad promised to spend as much as the US to fight this Jihad. At least three billion more dollars (the amount Washington gave) therefore transited through Pakistan. In both cases, Pakistan was involved - as an ally or as the battlefield of a proxy war whose stake was the Shia/Sunni conflict, that was to be known as “sectarianism”. The Saudi influence over Pakistan is not only (geo)political and financial. It is also cultural and religious. First, the Saudis have been in a position to fund a large number of dini madaris (coranic schools) in Pakistan in the context of Zia’s Islamisation policy and, more importantly, during the anti-Soviet Jihad which gave the Saudis a great opportunity to expand. Second, Pakistani migrants in the Gulf countries and in Saudi Arabia (about 5 million people sending 20 billion dollars of remittances) brought back to their country a different version of Islam – and sometimes prejudices against Shias. In spite of the formidable rapprochement (and even osmosis) that has developed between Pakistan and Saudi Arabia since the 1970s, Riyad is not likely to be a patron to the same extent as Washington for Pakistan, as Sana Haroon demonstrates in the last chapter of this book. First, the Saudis are not prepared to alienate India, a traditional partner which imports 11% of its oil from the Kingdom. They have wanted India to join the OIC as an observer since 1969 - a move Pakistan has always vetoed. Second, Pakistan is not willing to alienate Iran, a neighbour which could sell gas to a country badly affected by an energy crunch today. Third, Riyad may not be in a position to give Pakistan as much money as the US. Washington, therefore, will probably remain a key partner by default for the Pakistani establishment, so long as the US will be prepared to help Islamabad. The Obama administration will probably reduce its support to Pakistan after 2015 because of the financial crunch and because it will have less troops to supply in Afghanistan. But the US will probably continue to be an important player in Pakistan and be in a position to watch the islamist and nuclear activities in the countries. 1 Aparna Pande, Explaining Pakistan’s Foreign Policy, London and New York, Routledge, 2011, p. 29. 3 Mohammad Ayub Khan, Friends not Masters. A Political Autobiography, Islamabad, Mr. Book, 2006 (1967), p. 65. 4 Khalid Bin Sayed, "Pakistan’s foreign policy: an analysis of Pakistan’s fears and interests", Asian Survey, 4(3), 1965, p. 747. 5 Cited in Aparna Pande, Explaining Pakistan’s foreign policy, London, Routledge, 2011, p. 24. 6 Cited in Dennis Kux, The United States and Pakistan, 1947-2000. Disenchanted Allies, Baltimore and London, The Johns Hopkins University Press, 2001, p. 20. 7 Today, the nuclear status of Pakistan is a major asset vis-à-vis the US. In fact, Washington is probably prepared to support Pakistan beyond its natural inclination because of the need it feels to maintain a channel of communication with a nuclear - and proliferating - country. 8 Zahid Hussain, Frontline Pakistan. The Struggle with Militant Islam, New York, Columbia University Press, 2007, p. 168. Very comprehensive, gives birds eye view of the dilemmas of Pak.. Islamic state based on anti India feeling is bound to face existential pressures. On top of this, it faces the vested I interested of security forces. Bangladesh has managed to come out of this bind. It has even implemented the death sentence for those who commited carnage at the time of its birth in 1971. When will the same phenomenon repeat itself in Pak? This is an issue the learned author could address in a subsequent piece. Outdated information, ergo irrelevant to Pakistan in 2016!